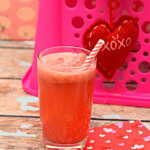 Sweetheart Pink Punch – A perfectly pink punch for Valentine’s Day. Combine all the 3 drinks into the punch bowl. Finish off with scoops of strawberry sorbet. Add a bottle of pink champagne if you want to give this a little kick for your Galentine’s Day celebration.